We’ve finally made it to Act 4 of A Midsummer Night’s Dream, also known as the act in which nothing interesting really happens. Yay. OK, enough holidays. Back to work! Phew. It took two years, but this scene is FINALLY over! HAPPY NEW YEAR! 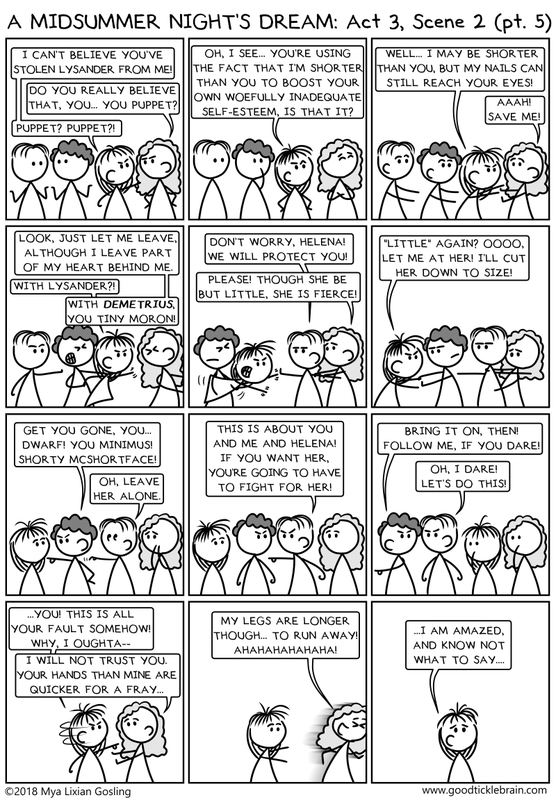 Let’s check in with some of our favorite Shakespearean characters and see what their plans for the new year are. Looking forward to sharing year SIX of Good Tickle Brain with you! *sniff* Webcomics grow up so fast nowadays…. It’s almost the most wonderful time of the year! Spice up your holidays with these cheerful Shakespearean Christmas Carols! Don’t forget to check out past years’ Shakespearean Christmas Carols: Part 1, Part 2, Part 3, and Part 4! I’m taking next week off, but I’ll see you back here on New Year’s Day for another year of Shakespearean fun! We’re almost done with this scene! Almost! Not quite! But almost! …and everything is STILL a mess! Good jobs, guys and girls. Comic love-potion-fueled hijinks and misunderstandings continue!